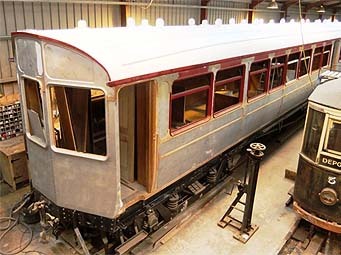 With all the attention over the past couple of months being focused on Steam Railmotor No 93 running on Network Rail, you may have thought that nothing was being done to progress the completion of its companion vehicle at Llangollen. 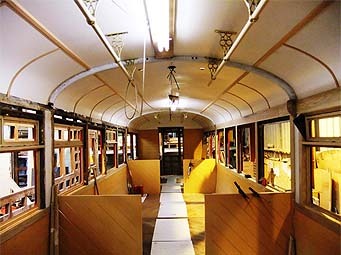 However quietly, and without any fanfare, a major milestone was reached at the beginning of November, when No 92 was moved from the C&W workshops up to the locomotive shed for final assembly of the under-frame mechanics and pipework systems, and completion of fitting out the interior with the multitude of items that turn a stark interior to the Edwardian elegance that has come to be associated with No 93. 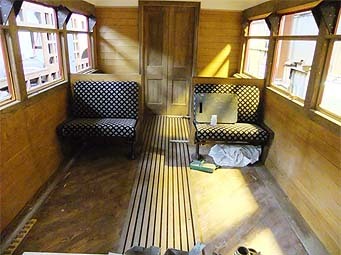 Progress over the last couple of months has seen the floor completed, the remaining seats installed, together with the window glass and associated mouldings fitted, the exterior painted and lined out to match the scheme on No 93, and the interior painting and varnishing completed. The detailed fitting out work will continue over the next couple of months, and planning is being put in place to undertake acceptance trials at Llangollen in the New Year. 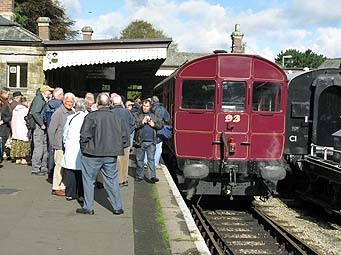 It’s proposed to leave No 92 at Llangollen between acceptance and when No 93 visits for their April Gala event, when the two vehicles will be together for the first time since July 2009, when the vehicles were trip worked to Milton before restoration commenced. 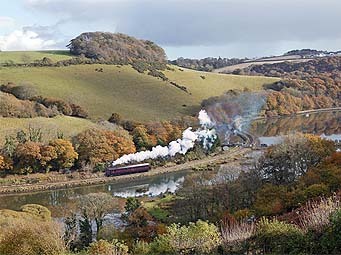 The Steam Railmotor spent the latter part of 2012 in Cornwall - featuring in a gala weekend at the Bodmin and Wenford Railway, and then spending two consecutive Sundays running trips on Network Rail's scenic Looe branch. 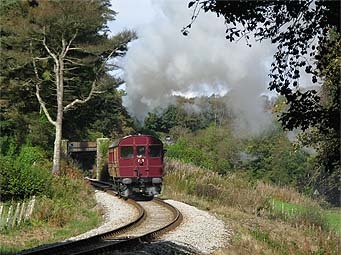 The Bodmin Gala ran from Friday 12 to Sunday 14 October 2012, and as well as the Railmotor, featured an Auto-train powered by a pannier tank and a four coach train powered by prairie tank 5552 or 2-8-0 tank 4247. Sadly the pannier which had only emerged from overhaul in the Bodmin workshops a few days earlier after a major overhaul, failed on Saturday morning, so the auto-train was unable to run from thereon. The Looe branch trips were originally scheduled for Sunday 4 and Sunday 11 November, but in the event took place on 11 and 18 November as the Class 37 diesel allocated by West Coast Railways to tow the Railmotor from Bodmin to Liskeard failed to start at Southall. Their back-up Class 47 diesel also failed, at Westbury (Wilts). Despite best efforts by West Coast Railways, First Great Western and Network Rail no suitable replacement locomotive could be provided. Operating restrictions placed on running the Railmotor on Network Rail meant that there was no alternative method of running the Railmotor from Bodmin to Liskeard. The 104-year-old wooden-bodied Steam Railmotor had cleared various hurdles to be allowed to run on Network Rail lines. 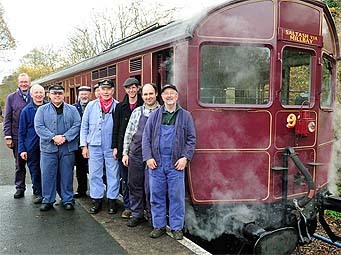 The train operator in Cornwall, First Great Western, was very supportive and sponsored the Looe branch events, with West Coast Railways being the train operator. The Liskeard and Looe Railway opened in 1860. Originally the terminus for Liskeard was at Moorswater, a little to the west of the town. In 1901 the railway opened a link from Coombe Junction to the GWR station at Liskeard, enabling Looe to be promoted by the railway as a holiday destination. The 8.75 mile journey from Liskeard to Looe starts with a steep descent to Coombe Junction, where the train reverses. The line then follows the East Looe river, which becomes a tidal estuary with Looe railway station opposite the point where the West Looe river joins the East Looe. 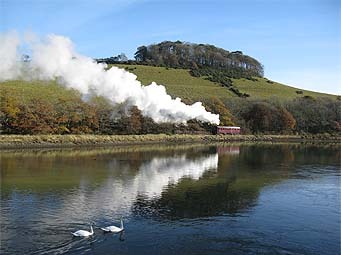 The Looe Valley Line is designated a Community Rail line and is now promoted by the Devon and Cornwall Rail Partnership. Left to right: Peter Jennings, Amyas Crump, Phil Cowley, Maurice Williams, Ann Davies, Ray Churchill, Mark Werrell, Mark Baldry and Graham Drew. A third West Coast diesel (Class 33) eventually arrived at Bodmin on Friday 9 November and the Railmotor was duly towed to Liskeard on Saturday evening ready for the following days events. There were five return trips on each Sunday, leaving Liskeard at 08:30, 10:30, 12:30, 14:30 and 16:30 with the trip taking around 40 minutes in each direction. 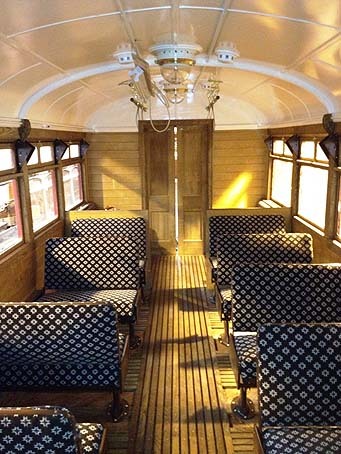 The train was permitted to carry 54 passengers per trip so tickets were in considerable demand with the original dates effectively selling out. Both Sundays offered glorious autumn sunshine, though there was a tendency to sudden sharp showers on the first Sunday. Some of the early trips on the first Sunday ran late whilst the crew got the feel of driving and firing this unusual machine, but by lunchtime all was running to time in the finest Great Western tradition, and it wasn't long before early arrivals began to be recorded. The Class 33 towed the Railmotor back to Bodmin on Monday 19 November. 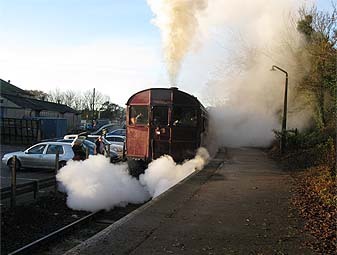 The Bodmin and Wenford Railway plan another gala at New Year, after which the Railmotor will undertake a gradual progress up-country, returning to Didcot in late spring. Trailer 92 work in progress. Progress over the last month has seen most of the exterior mouldings completed and work started on construction of the eight doors. At the end of the month the two driver’s vestibule doors had been hung and work had commenced on the central passenger doors. Completion of these mouldings has allowed painting to commence, and No. 92 is beginning to look more like an Auto Coach at last. 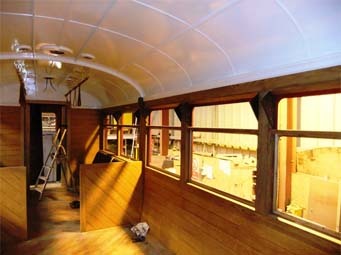 Inside the vehicle work continued on laying the hardwood floor timbers, completion of the partition doors and continuing installation of various mouldings and fittings together with the first of the walkover seats. The interior is beginning to look like a carbon copy of No 93, and it will only be in the detail that you will see the differences between the 1908 and 1212 specifications. 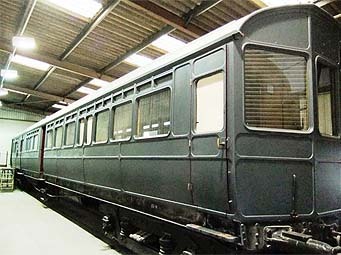 Over the last couple of months work has continued on manufacturing and fitting the hundreds of feet of hardwood mouldings, both in the main passenger saloons and the vehicle exterior, together with making and installing the partition sliding doors. The decision was taken to make new doors as the originals looked as if they had been used for darts practice over the years the coach was used for accommodation, and were considered beyond restoration. 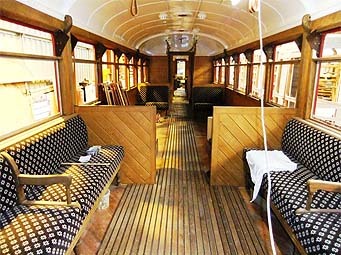 The bench seats have also been installed in both saloons, allowing Llangollen’s C&W ample opportunity to rest in comfort. 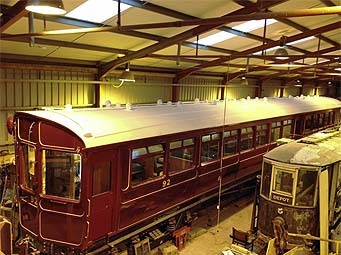 The roof is now complete with the canvas fitted and painted, gaslight vents and saloon ventilators installed, along with the gutters, rain strips and gas pipes, and on the engineering side refurbishing the retractable steps and regulator assembly for the driving compartment is in progress. 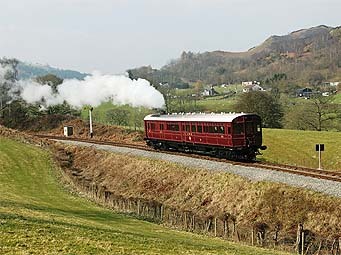 A taste of things to come – this on the Llangollen Railway, but could soon be anywhere. Following a suggestion from one of the Train Operating Companies the Project has been working towards obtaining Main Line certification to allow the Railmotor to run in selected locations on Network Rail. 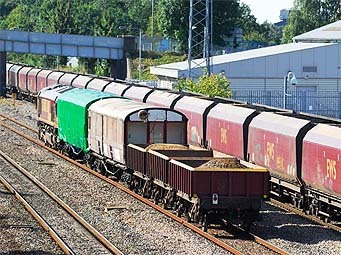 An initial approach to the Office of Rail Regulation to run wood bodied stock with no secondary door locks and no on-board safety systems met with a positive response, subject to satisfactory safety measures, operating procedures and derogations from Railway Group Standards being in place. So, despite the negative views of some within the preservation movement it was decided to see what could be achieved, and the work was taken forward on the basis of nothing ventured, nothing gained. The starting point was that the historic nature of the vehicle should not be compromised, and the recognition that things could fail at any point. After a good deal of preparatory work had been undertaken, cold, hot and paperwork audit inspections were done by the Society’s VAB, together with trials on brake, cant and detonator audibility, and vehicle maintenance procedures were incorporated in the GWS Maintenance Policy and Plans document. The result of all this activity has been the issue of the necessary Safety Certification and Engineering Acceptance. At the Rail Safety & Standards Board meeting in June Project Manager Graham Drew, in conjunction with the Society’s Train Operating Company, presented a 53 page document detailing the mitigations from Railway Group Standards, resulting after some discussions, in RSSB approval being given. This approval is not location specific, nor does it include additional operating restrictions over and above those already specified, so we are more than pleased with the end result, and it makes all the work put into the document worth while. The process has taken over twelve months, from the initial suggestion that “wouldn’t it be nice if.....” was made, to obtaining Main Line certification, and the Society’s thanks go to all in the various RSSB, ORR, VAB, TOC, and N.R. Departments who have given support to the scheme that some said was impossible and many said would never be allowed. 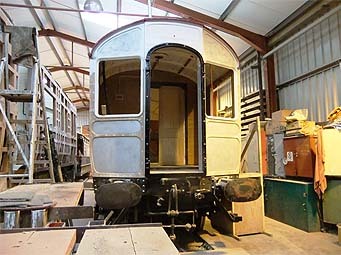 We now move forward with vehicle route acceptance to see where all this work will take us (literally), but in the meantime the Railmotor will be operating at Didcot for the Summer season – steaming dates will be found on the Didcot website. Pete Speller applying the finishing touches to the lining. Trailer No. 92 Roof Work in Progress. Following replacement of the exterior body mouldings in Didcot’s C&W works by GWS members Mark Werrell and Pete Speller, Railmotor No. 93 has been repainted and lined out, and has returned to traffic for the Jubilee Bank Holiday weekend. It’s been over a year since first entering service at Didcot, and following annual boiler examinations a test steaming was undertaken on Friday 1st, with the SRM entering traffic on the following day. The photo shows Pete applying the finishing touches to the lining during the preceding week. Details of operating days can be found on the DRC website to enable you to come and admire Mark and Pete’s work. At Llangollen work is also progressing on Trailer No. 92, which has disappeared under a pile of scaffolding to enable the roof to be completed. The canvas covering has been applied and the rail strips and gutters fixed in place. 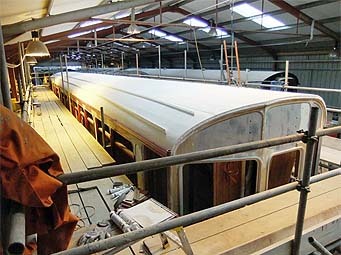 The photo shows work in progress, with the saloon and gas lamp vents yet to be located and the gas pipes installed. 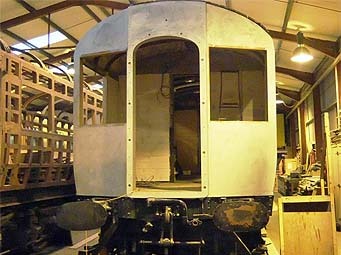 Also of note are the window and body mouldings applied to the driving end. Inside the vehicle work continues on the partition sliding doors and manufacture and fixing of window and toplight mouldings - a long and tedious job that will take many hours to complete. 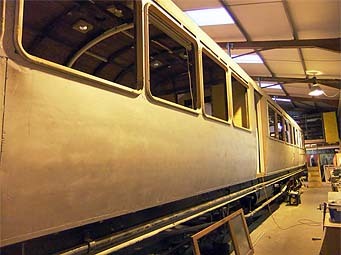 Railmotor 93 ready for painting in Crimson Lake. This month the Railmotor 93 is in the spotlight. Problems with the exterior mouldings detailed in November last year have been addressed over the winter period by the simple exercise of removing all the old mouldings, manufacturing new in a different material and replacing them – Sounds simple, but it has taken the three months from the beginning of the year to achieve this and the reach the point where the vehicle can be repainted. 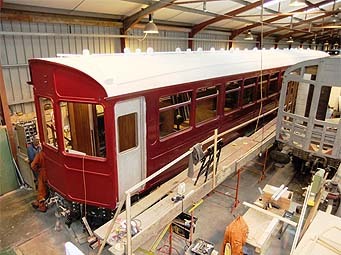 The photos show No 93 in Didcot’s C&W finishing bay at the end of March, with the body in undercoat just before the new Crimson Lake top coat is applied. With it’s annual boiler exam due this month, and some routine maintenance undertaken while the body repairs were underway, No. 93 will soon be back in operation at Didcot and ready to go ‘on tour’ later in the year. Operating locations and dates will be posted on both this web site and the Didcot site once arrangements have been firmed up with the various railways. Work in progress in the Smoking Saloon. February has seen work progressing on both the interior and exterior of Number 92. The window sub frames together with the opening top lights have been ordered, deliveries are currently being made and the units fitted. The driving end vestibule structure has now been completed and clad, and at the other end the luggage compartment interior cladding has been completed. 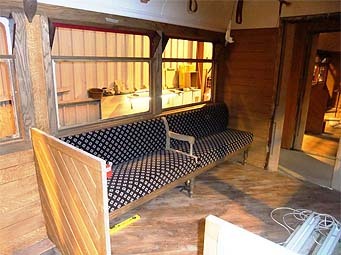 In the passenger saloons the T&G floor has been laid and the short sub-partitions dividing the walk-over and bench seat areas have been installed. In addition the roof lining is now complete, mouldings are being applied and vent and light mounting blocks are ready for fitting together with the brass brackets for the grab rails. Most of the hardwood sections for the interior mouldings have been delivered and the exterior moulding materials are to hand ready for machining. The final batch of orders for various fittings have been placed, and deliveries of items such as correct pattern top light catches, sliding door runners and lamp brackets are expected soon. The rolled steel sections for the gangway are being made, and the “scissors” will be assembled as soon as this is complete. An exterior view showing the completed cladding and bolection mouldings. The gangway end showing the completed connection timberwork and reinstated window openings. Driving end reconstruction in progress. 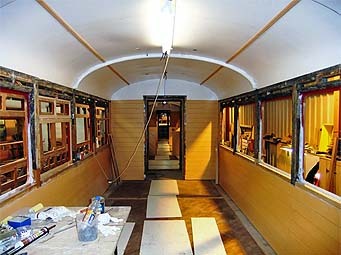 A view down the ‘smoking’ saloon showing completed cladding and work in progress on the ceiling. Since the update in November last year considerable progress has been made on the bodywork of No. 92. 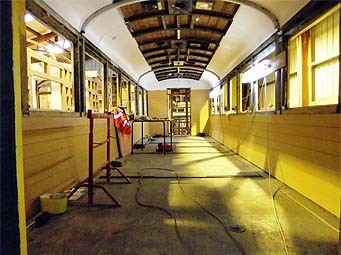 The gangway end of the coach has seen the exterior panelling fitted and the window openings ready to receive the mouldings and glass sub frames. No. 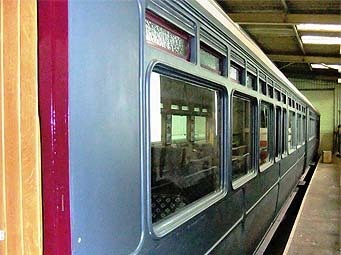 92 had its gangway end windows blanked off in February 1935, considerably altering the appearance of the vehicle at that end, and these are now being reinstated. 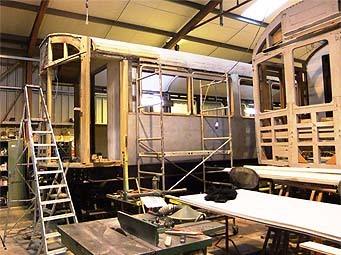 The exterior panels have been fitted to the complete length of the second side together with the bolection mouldings round the windows, which on No 92 are different from the Railmotor, being fitted round the complete window assembly, including the opening toplights. The driving end re-construction is progressing , the final main corner post timber having now been delivered, allowing work to progress. 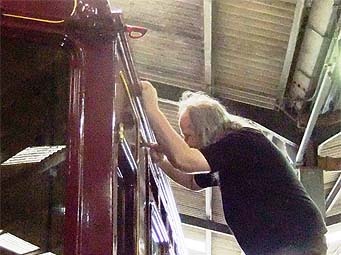 The condition of the driving end was similar to the gangway end – mostly soggy wood and a few rusting fasteners, so it has had to be completely rebuilt with new timbers. including both main corner posts and both intermediate posts. Inside the coach all the cladding work below the windows has been completed, and wiring for the lights and communication bell installed, thus allowing ceiling cladding to be formed and fitted. Interior partitions have been progressed up to the point where the doors need to be fitted, and we are currently having new brass bottom door runners made to enable this to proceed.